Last weekend, on a family trip to the Kern River in Central California, we went to the Trail of a Hundred Giants in Sequoia National park. Giant Sequoia trees are some of the largest and longest living creatures on earth, and can only be found on the western slopes of the Sierra Nevada range in California. They are massive glorious beautiful trees, so tall that you can’t see the tops of them when you stand beneath them. You have to back way, way up to get one whole tree in a picture. And before. 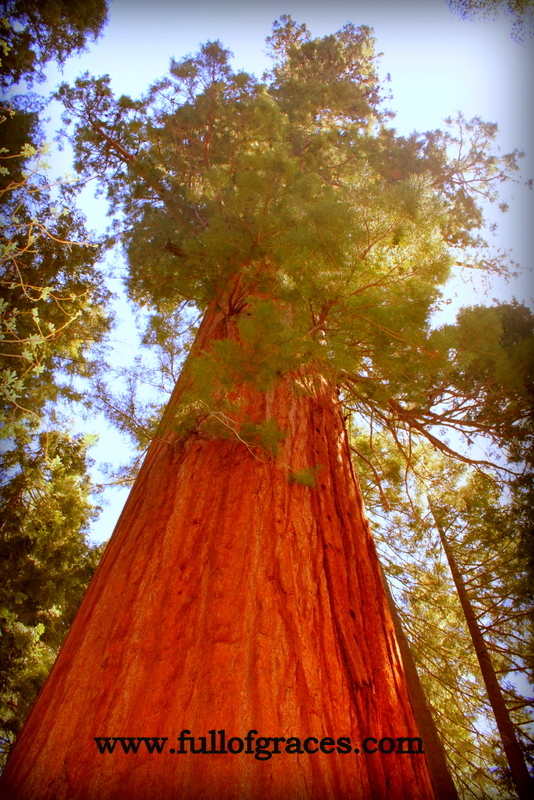 The oldest known Giant Sequoia is 3,500 years old. When I go to places of natural beauty, I always feel small, young and insignificant. I comprehend the enormity of time that has been and will be. I know my footsteps join countless others over thousands of years. And that we have all looked at the same thing. That blows my mind. It reminds me of my space. Just a small space in the Grand Scheme. It never makes me feel sad or futile, though. It was Divine Inspiration that we preserved these places in a nation where we are usually so quick to claim and conquer. That was the hand of God staying the ambition of man. I always come back from the beach, or a trip to a national park, with a better sense of my priorities and a renewed commitment to simplicity. I feel more connected to God and what’s important. I feel good as a mom, bringing my kids to places where God can be found. I want them to feel what I feel in these places: small, young and insignificant. I want them to be humbled in the face of something so much bigger and stronger and wiser than they are. Then they’ll know what I know, what anyone with an open heart can know in these places. God made the waves. God made the rocks. And God made the Giants. Thank you! Those trees were amazing! This place takes my breath away, every time. Thank God!